Via Frankfurt I flew to Chicago for the football coach convention of the US coaching organization USC (former NSCAA) with over 13,000 participants. At the booth of Meyer & Meyer I informed about innovations of our software products and DVDs / books. 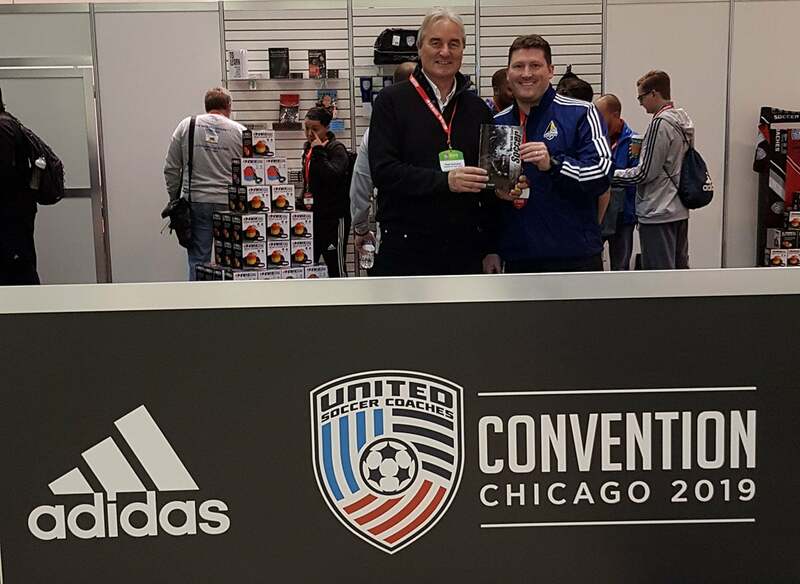 In addition to participating in practice and theory, I also met some trainers from the USA and our author Wayne Harrison, who will give a talk on soccer awareness. Today, orientation was first announced in Chicago. 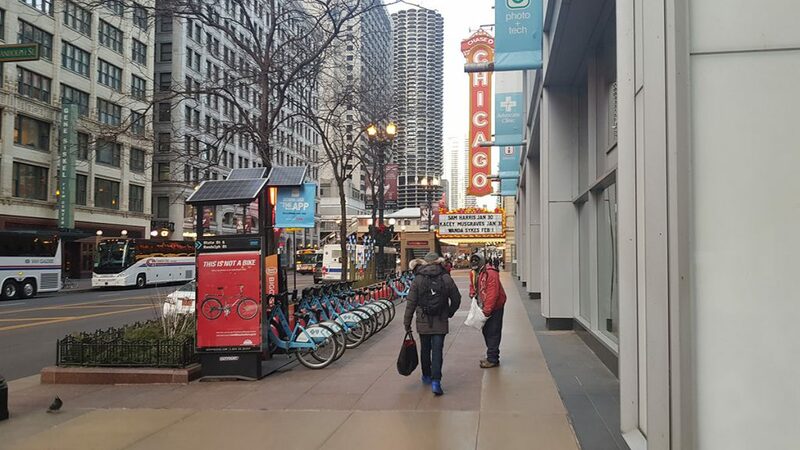 With a 7-day ticket, I was able to travel freely in Chicago by metro and bus, which I used extensively. 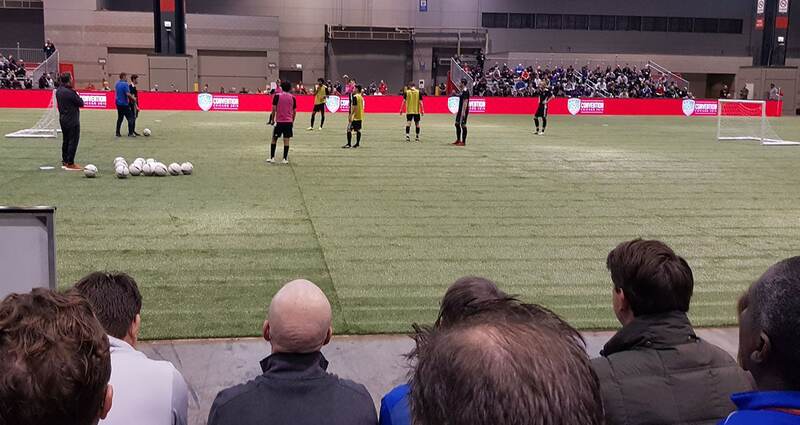 Since I had plenty of time on Wednesday, I drove to the Congress Center, where I happened to get into a classroom session by Raymond Verheijen. It was very interesting, but I was not logged in and wanted to see more of Chicago. In the evening I went to the Congress Center again and met some coaches from USA. In addition, I could see two practice units. Now it is starting. I went to the booth of Meyer & Meyer to meet Martin Meyer, Philip Müller (President of the Swiss Trainers Association and some coaches), and there was a full program on this day: 14 practice units and about 80 theory units. 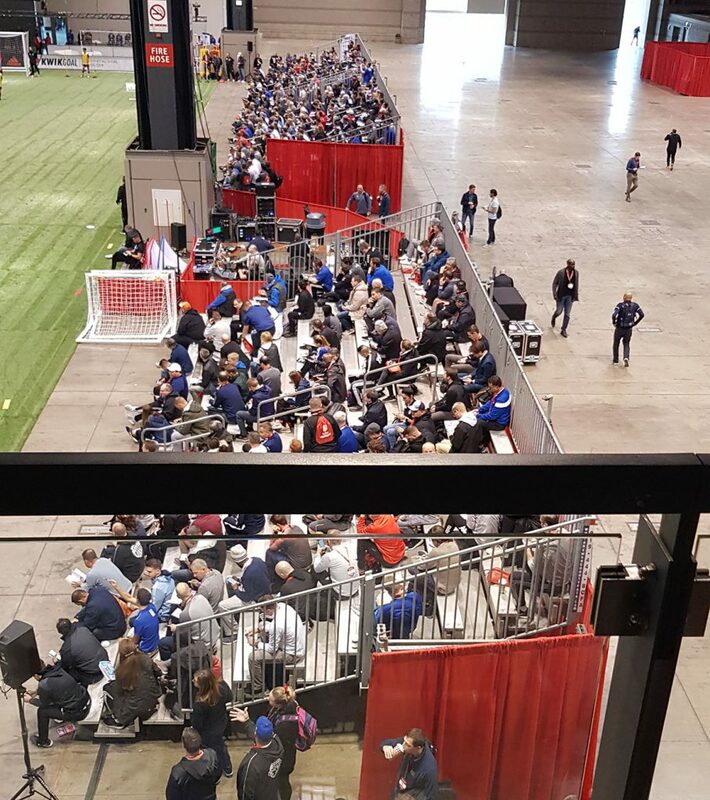 The exhibitors demanded a lot of crowds at the stands. 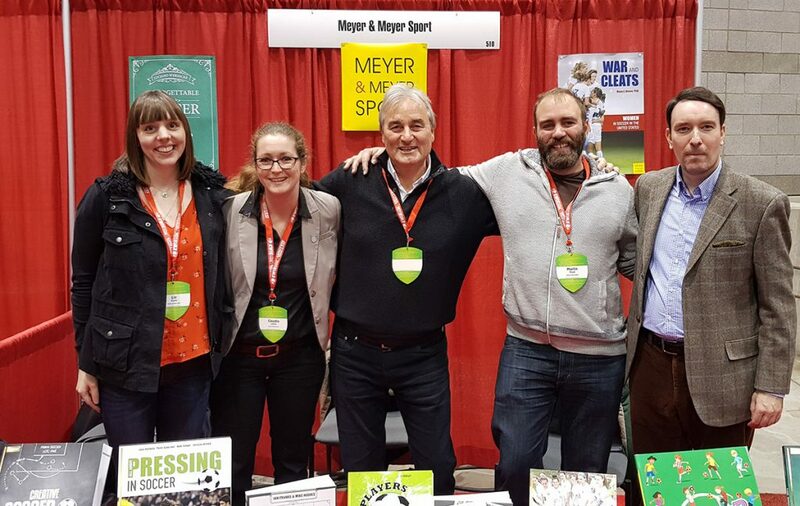 After I had a look at a practice, I met many coaches who had arranged to meet me at the booth of Meyer & Meyer. f.l. Liz Evens, Claudia Lürken, Peter Schreiner, Martin Meyer (Verleger), Philip Müller (Präsident der Trainervereinigung Schweiz). 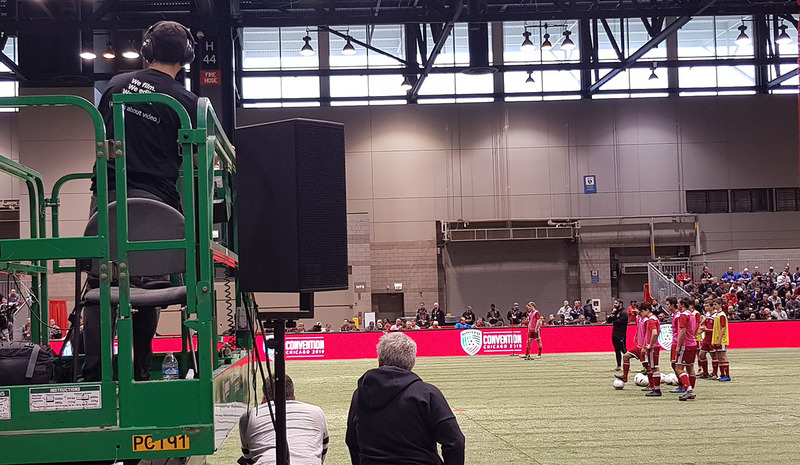 All practice sessions were recorded with great technical effort and later sold! Coincidentally, I met Mirko Schroff, coaching director in Canada, who years ago translated and spoke some DVDs in English. 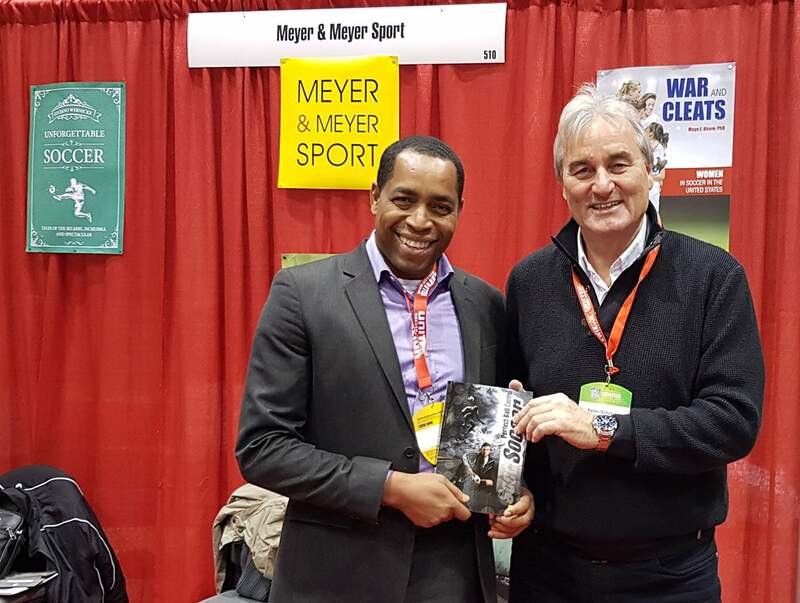 My book “Perfect Ball Control” is very popular in the USA, as is “Attacking Soccer”, both published by Meyer & Meyer. On Friday (11.01.2019) many meetings were at the stand. There was little time to go to the practice or theory units. 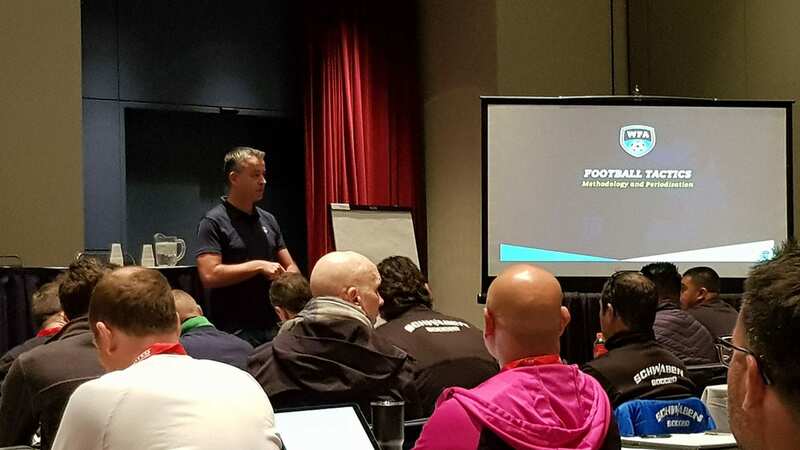 Todd Beane, founder of the TOVO Academy, presented – “Cognitive Progressions”. He developed in several stages in 6 against 3 with 3 colors a perfect behavior in space (posture, position in space and interaction) up to the game on two goals. 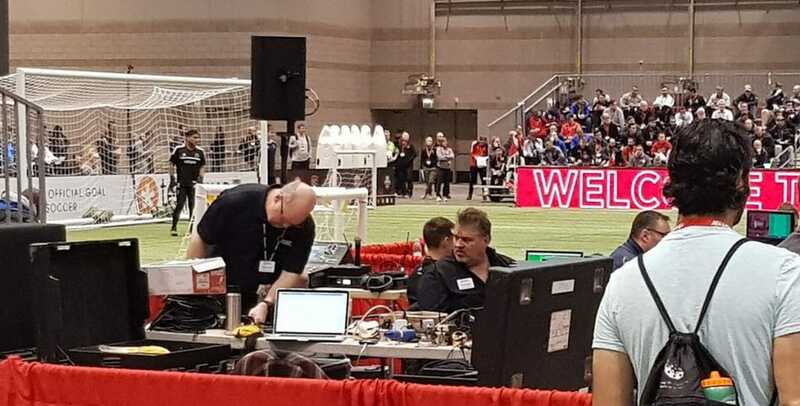 Todd Beane showed a perfect coaching and an interesting address of the audience. One of the best presentations at the convention! In the second presentation I saw Raymond Verheijen. 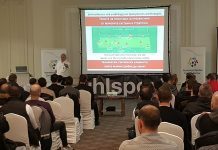 He showed “How to Improve 11v11 Playing Style with 12-16 Players”. 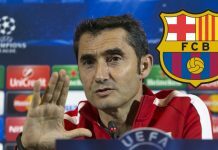 It was about the systematic removal of players from 11 to 11 according to a priority list, without changing the game idea. 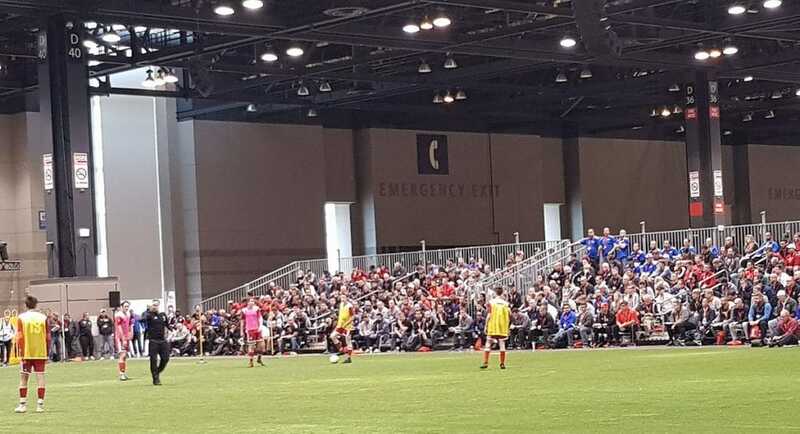 The initially full grandstand emptied rapidly, because the presentation was too demanding and tactical for many coaches. The contents could have been conveyed in 20 minutes. For me, the concept was interesting and well-coached. After that I met Wayne Harrison, who had a classroom session “Soccer Awareness”. Two years ago, Wayne presented similar content in theory and practice at the 1st Derbystar Congress in Duisburg. Saturday content was a bit disappointing. The practice units that I could see had not met my expectations. 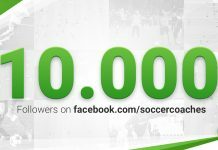 This was especially true for the presentation of the U17 national coach of France on the topic “Game Principles – Play in the Gap”. 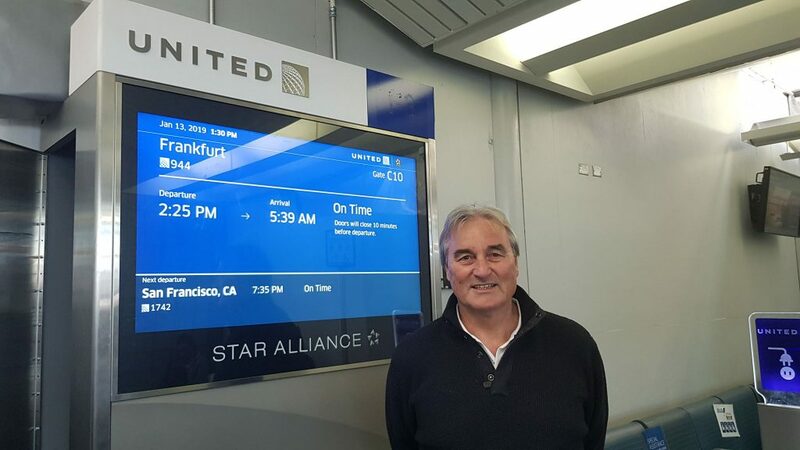 At 2:25 my plane went from Chicago via Frankfurt back to Düsseldorf. Busy journey, successful networking with many new contacts, many trainers have stocked up with DVDs, books and software. On Monday then the normal business continues!